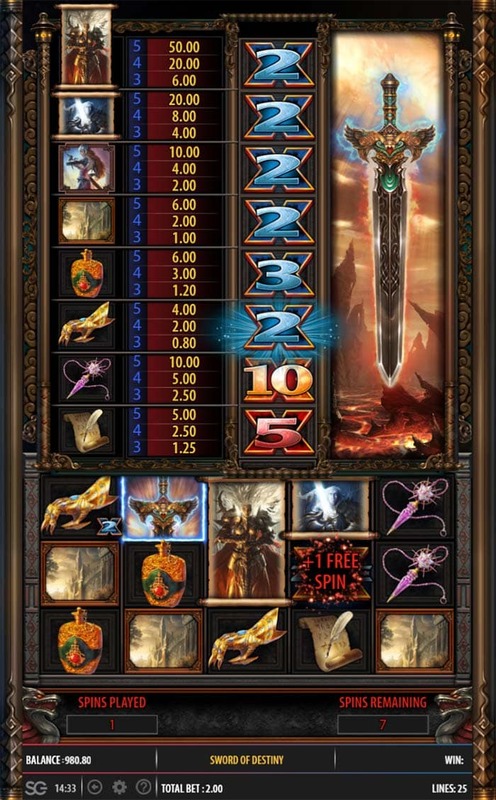 LeoVegas Casino has recently added the latest Bally (SGi) slot titled Sword of Destiny to their casino with is a unique cabinet style online slot that is running on the new X-Zone Engine whilst there does seem to be lots of similarities in gameplay to the awesome Thundercats slot from Blueprint Gaming there are a whole host of new features to look out for too. 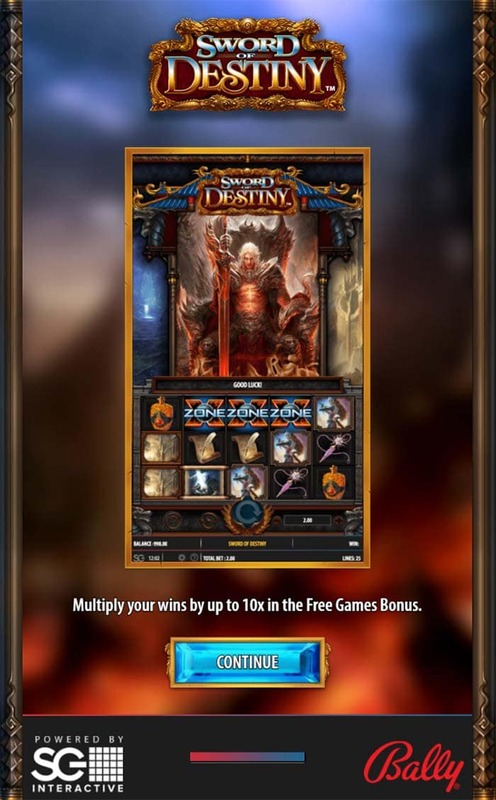 The Sword of Destiny slot starts off as a regular 5×3 reel slot with 25 fixed paylines in an upright portrait design which is extremely well suited to mobile devices with some awesome animated visuals above the slot that are constantly on rotation. 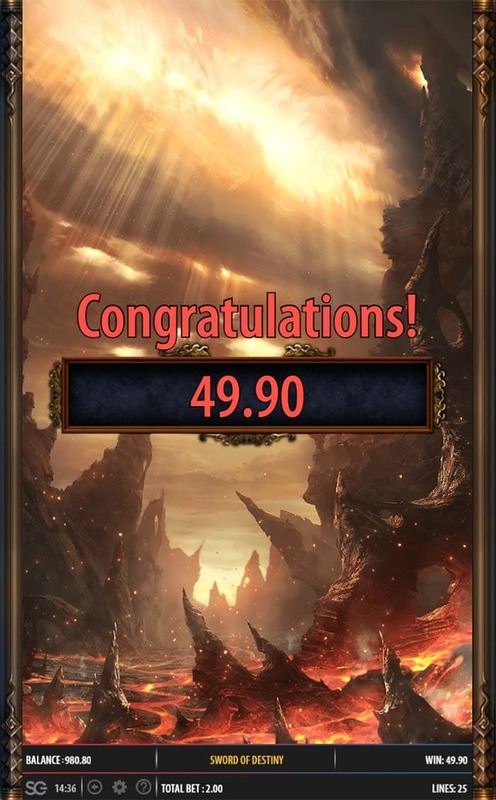 There are several base game mini features that will cause the reels to rumble and expand creating a 5×6 reel array with 50 paylines with features such as Clumped Wilds, Random Wilds, Picture Wilds and Symbols Upgrades that are randomly chosen when this feature kicks into play. 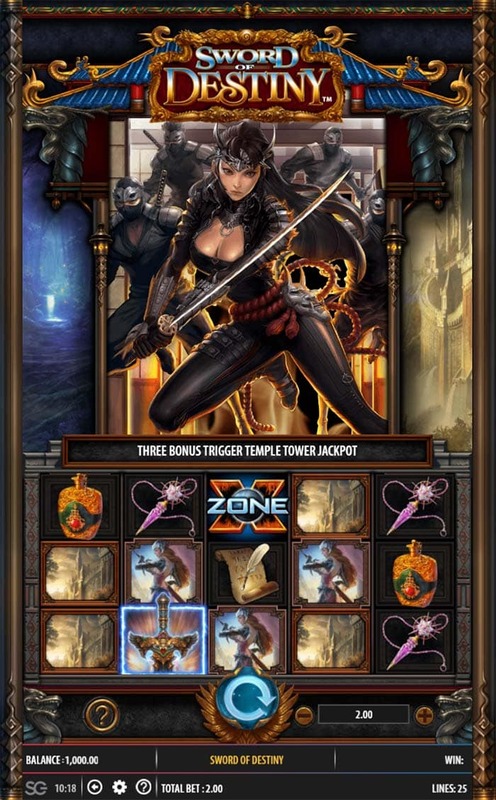 Along with all the base game features, there are 2 triggerable bonus features to look out for, the first is a Temple Tower Jackpot feature with a coin picking bonus round on offer and some huge rewards and the second is the main Free Spins bonus round where special multipliers come into play up to a massive 10x applied to specific symbol wins. In the base game, there are several different mini features that can trigger randomly on any spin, this causes the reels to rumble and grows in size to a 50 payline slot whilst a random feature is selected. Clumped Wilds – 1-3 Reels are selected with Clumped Wilds (Sword Icon) added that cover the entire reel. Random Wilds – 4-9 positions on the expanded reels are covered in wild symbols. Picture Wilds – 4-10 adjacent areas on the reels are covered with a special Picture Symbol that acts as a wild. 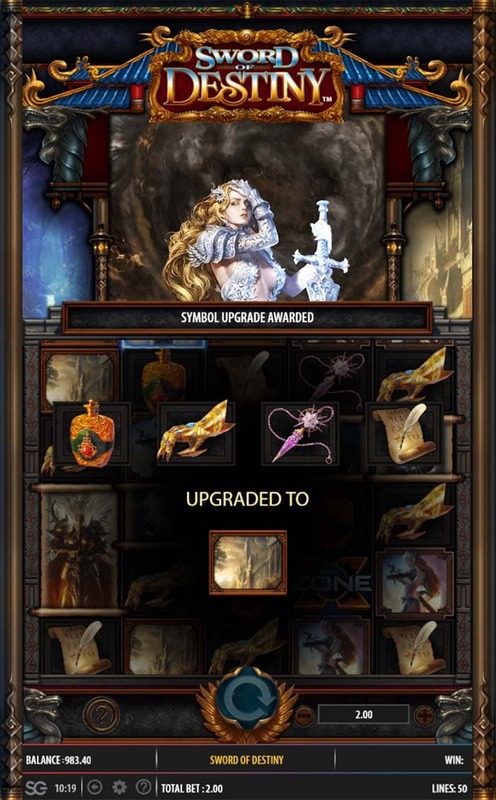 Symbol Upgrade – 2 or more of the symbols are chosen to be upgraded to a high paying symbols after the spin. 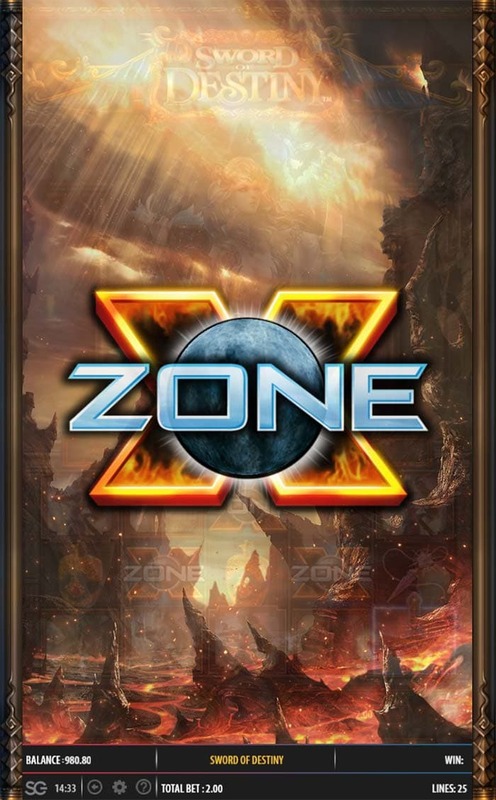 The free spins round is triggered by landing 3 of the X-Zone Scatter symbols on the middle reels, this then grants you with an initial 8 free spins with the possibility of extra spins being awarded during the bonus round. During the free spins round, there are special multipliers applied to all wins, with the paytables above the slot updating the value of each win during each free spin, the multiplier values range from 2x right up to 10x. Once a winning combination is found the multiplier is then removed from the paytable and the rest of the multipliers tumble down with a new random multiplier added to the top of the paytable, sounds confusing but it’s quite straightforward. 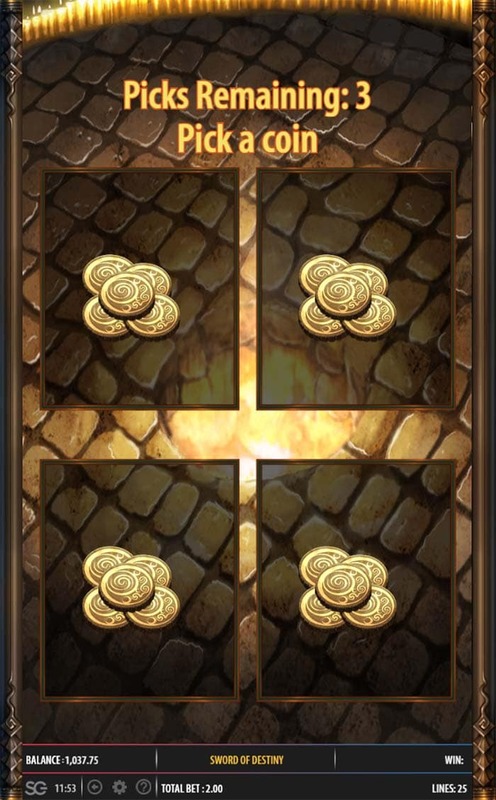 The Temple Tower Jackpot feature is triggered by landing 2 of the special Coin symbols on reels 1, 3, and 5. You are then transported to a simple picking round where you get to uncover a number of coins from each pick and this climbs you up the jackpot ladder with regular cash prizes and jackpots on offer. 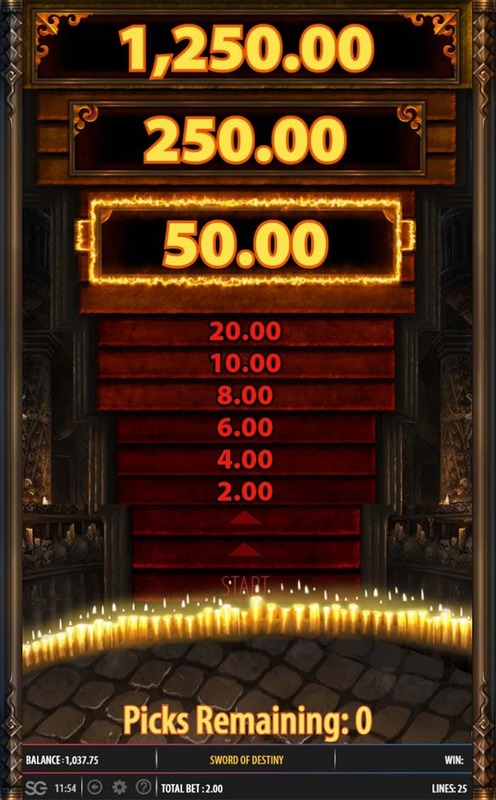 The coins picks range from 1-6 coins and it’s worth noting there are several steps required to get past each of the higher Jackpot prize levels (see screenshots). Sword of Destiny is a very decent slot release from Bally, the slot has some superb graphics and visuals and some interesting base game and bonus features. Whilst the pays in the base game aren’t anything to get too excited about, the mini features can really help boost wins, especially with the Clumped Wilds feature. 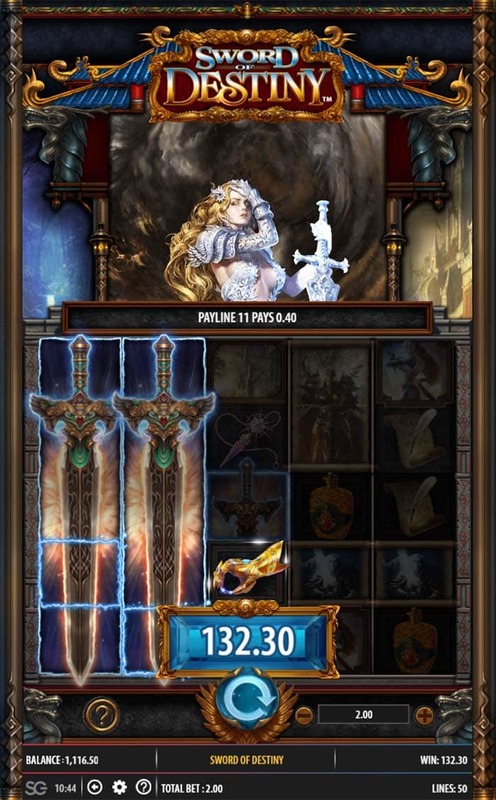 The main complaint is the small viewable area of the reels if you play on a particularly large resolution monitor, whilst this slot will look and play amazing on a mobile phone it suffers from the portrait style on a desktop computer. Overall a much better release from Bally (SGi) and certainly worth a play.